Student at “La Rizière” Hospitality School in Fianarantsoa – Madagascar. In countries where tourism is a buoyant sector and constitutes an incredible lever for economic and social development, the IECD offers its support for the creation or improvement of hospitality-catering schools. 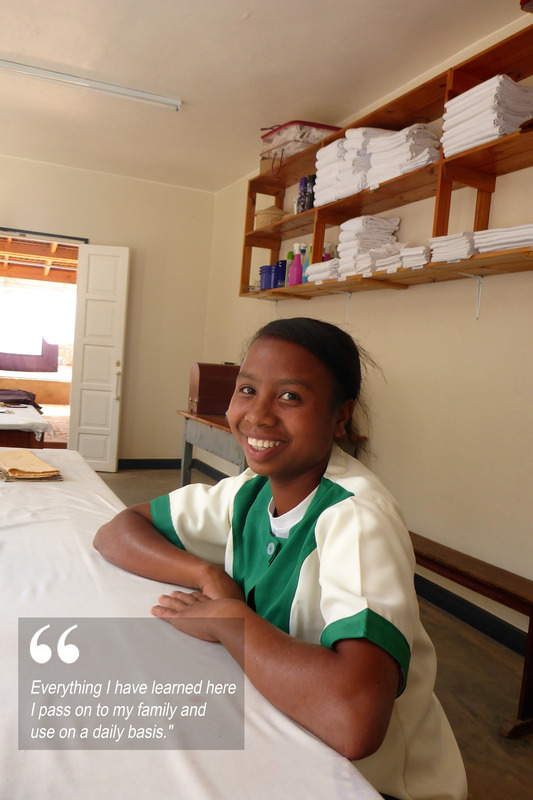 Thus, since 2012, the “La Rizière” hospitality-catering school in Madagascar helps young people in difficulty to learn vocational skills adapted to the needs of the hospitality sector and join the economic dynamic of their country in order to integrate society in the long-term. Soarazy is 18 years old. She comes from a family of nine children. Wishing to start work as soon as possible in order to help her parents, she stopped school in the first year of high school. However, encouraged by her family, she decided to spend a year following a course as an accommodation assistant at “La Rizière” hospitality school. “I chose the sector of accommodation assistant because I believed I was capable of following the training and passing the exam. I really enjoyed the year spent at “La Rizière” hospitality school. There, I learned the profession of chambermaid and I enjoy it: I like tidying up and taking care of the decoration of rooms for our guests. Everything I have learned here I pass on to my family and use on a daily basis. At home, I have become more organized, my space is always clean and tidy. Practical work on welcoming guests was the most difficult thing for me because I didn’t speak good French. But, I managed and I passed my final evaluation.